An alternative to the above example of track arrangements in which groups of Dub Inputs were followed by groups of Output tracks, is to put each Output track below its Dub Input track. Creating Multiple APT processes in this case is once again straightforward. Example: The main difference in this arrangement as shown below left is that the Dub inputs (Vox 2, Vox 3 and Vox 4) are two tracks apart (i.e. in tracks 2, 4 and 6). Each of these input tracks is followed by a track (Output 1, Output 2 and Output 3) that will receive the APT processes' output (into tracks 3, 5 and 7). This arrangement simply requires that in the New Process window, we have to set Dub Track Increment to be 2. 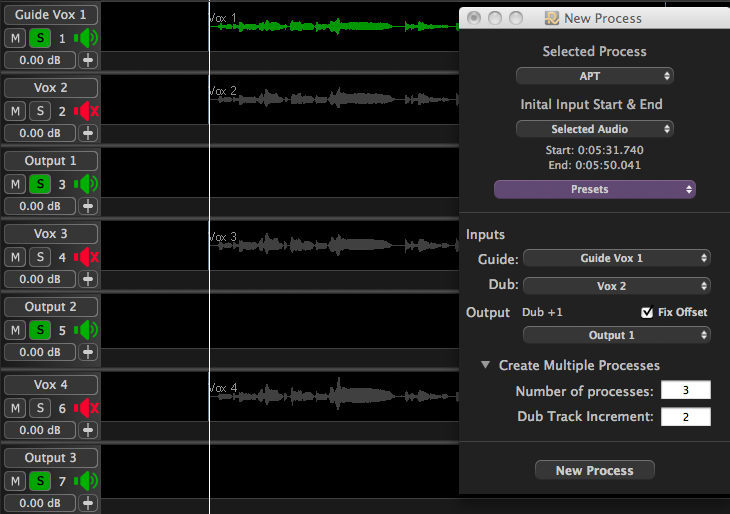 If, as before, we want to create 3 APT processes (one for each Dub input), the Number of processes is 3. 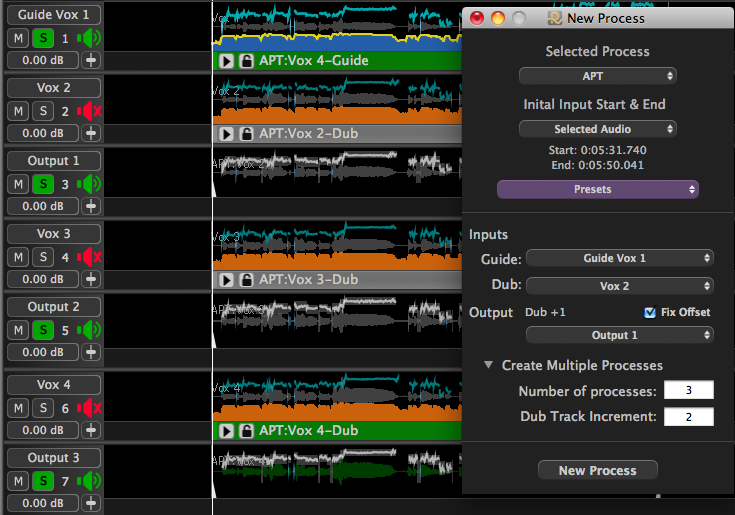 When we turn the "Fix Offset" ON, then we see the APT Output will go to the number of the Dub track + 1. After the keys N key is pressed (to create and run the processes), the result is shown in picture below, with the APT Dub Process Controls on the Input tracks and the corresponding Output audio being correctly placed in each Output track under the corresponding Dub track.